click here When trees speak, their message is not so much heard as felt. So much of the wealth of the world we owe to trees. We build our homes from their bones. 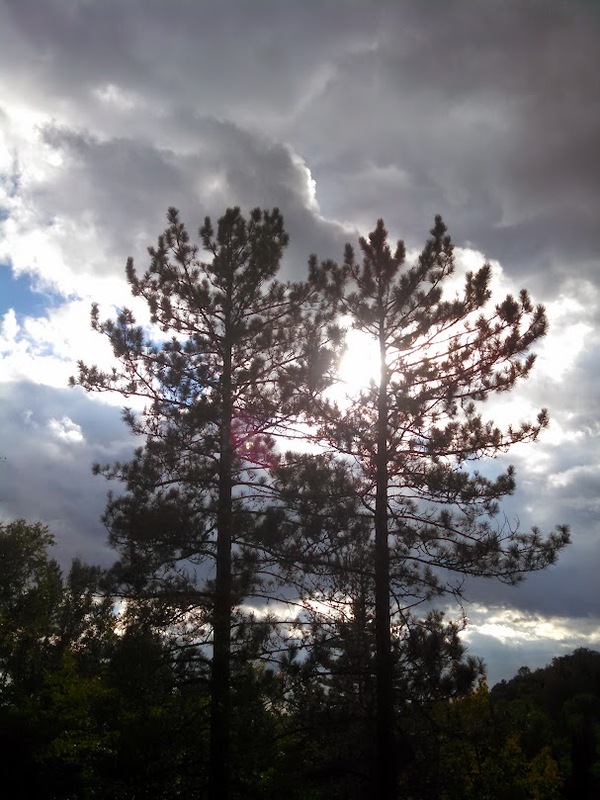 Trees fabricate the very air we breathe. conjured from water, light, and stone. They temper the winds and rain. What makes us think the world will stop if we leave our desks for a day or two? This Buffalo confronts us head-on. It doesn’t seem aggressive, but you can’t ignore its assertive presence. Perhaps it is challenging us to face our fears and live up to our dreams. This is primarily a Yellow buffalo, with hints of Red. Yellow brings to mind the 3rd chakra, or Power Center, and Red is the color of the 1st, or Root chakra. These are both warm colors, contrasting sharply with the wintery landscape. This creature is grounded, powerful, and very much alive. Although it is still at the moment, the Buffalo’s order now Breath is visible, jetting forcefully from its nostrils. Breath represents Life and Spirit. It evokes all 4 elements: it is made up of water and air, emanates from the physical body (earth), and contains the heat (fire) that living things generate and carry within them. The breath coming out could represent creative energy, or one’s life force in action. This Buffalo’s environment is significant. You can see the roundness of the earth in the exaggerated horizon. In fact, the earth seems rather small compared to the size of the animal. To me this is an indication of how significant one’s presence and actions on the earth really are. (You are more powerful than you know!) It is winter, which is a time of rest between cycles. A large animal like the buffalo must eat a lot; because food is scarce in winter it must rely on fat stores from summer to carry it through. Therefore it must trust that when the snows come and the earth chills and darkens, this is a temporary condition and a part of the natural cycle. The Buffalo knows that Spring will come again, and does not panic! A row of buy now Trees rings the horizon. Trees connect heaven and earth, and are highly spiritual beings. These trees are bare and dormant, but the ghostly flower pattern showing in the snow indicates that under the frigid ice life stirs, ready to spring forth in abundance with the first warm breaths of buy now Spring. 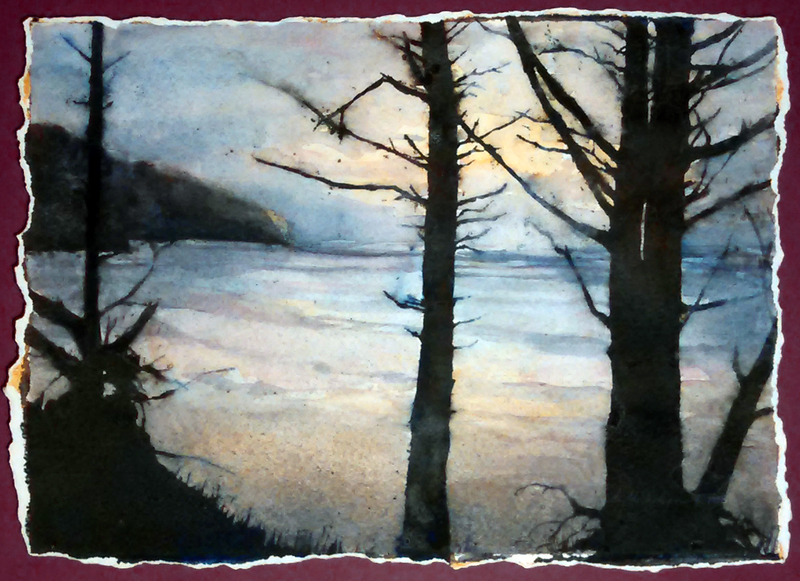 This pending event is hinted at by the wintery order now Sun in the painting. It struggles to break through the clouds with a cold, watery light, but as the days grow longer it will gain in strength and warmth, providing the energy to nourish all life on Earth through another yearly cycle. Is this Sun rising or setting? It could be either, representing either new beginnings or the end of a phase or cycle. (Remember, though, that in every ending lies the seed of a new beginning.) The lighting and shadows reveal no set direction, allowing for whatever interpretation feels right at the moment. The buffalo, too, sometimes appears red, sometimes yellow. Either way, it indicates a period of transition, or a pause between periods of growth – underscoring the theme of winter. If you would like to meditate on this image to help you through a transitional period, you might want to imagine it as a setting sun at first, and change to a rising sun as you begin to feel your energies rise again. Many traditions associate Crows with magic, sometimes black magic. While Crows are certainly Black, I don’t feel them to be a bad omen. Rather, their color signifies a deeply Feminine energy and access to the unseen spiritual world. Crows have wonderful, strong (some say harsh, but I think they’re beautiful!) voices that carry a long way, and they are great at warning each other of approaching danger. They are a reminder to listen to and heed the warnings of one’s intuition. Crows are, in many traditions, a Trickster animal. They are also opportunists, and great at not just surviving but adapting and thriving – which is why you are just as likely to meet up with a Crow in the city as in deep wilderness. 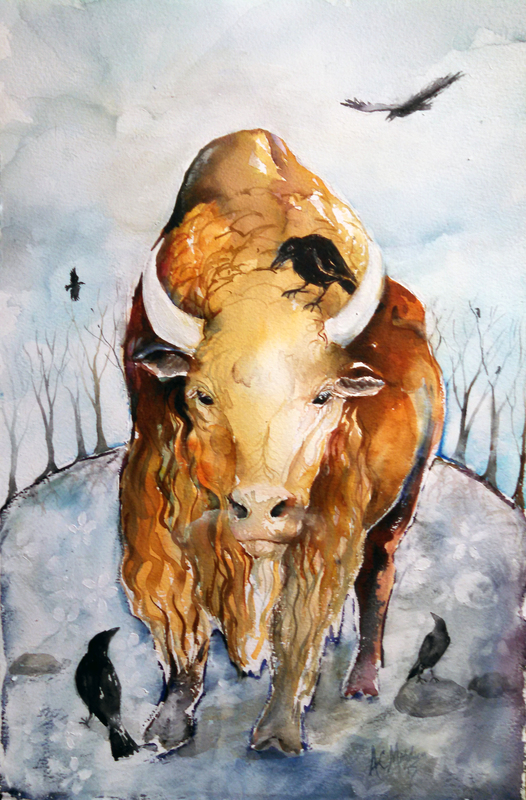 These particular crows appear a little impish, irreverently perching on and around the majestic Buffalo. They tell us it’s ok to have fun and be bold when pursuing our dreams and goals. The fun thing about symbols is that they mean different things to different people. I’m always interested to hear what other people take away from the images I create. What does this painting say to you?